Also, I am joyous over the thought of everyone playing hockey. Them all playing hockey would be EPIC. Probably. Does she have freckles or smallpox. I do wonder when we’ll get back to Coal and what he was running towards….. 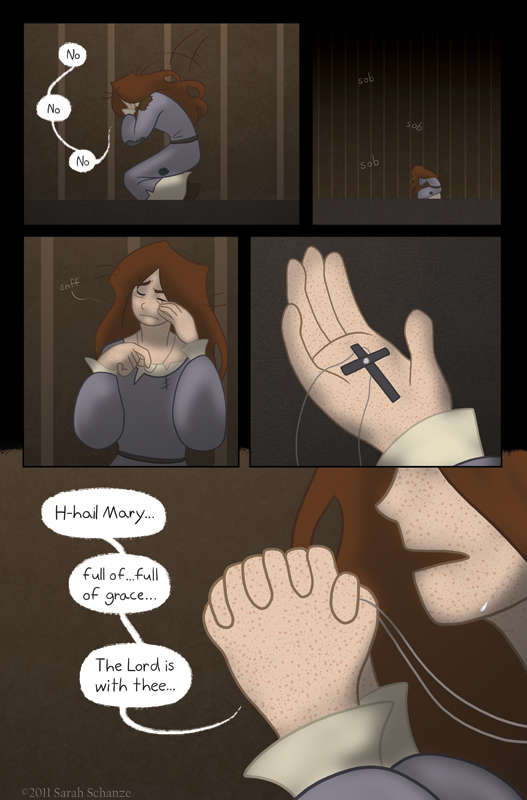 I am not Catholic, but I do know the Hail Mary Prayer wasn’t yet used during this particular timeline..Soooo for goodness sake of the comic (which I like), I will turn a blind eye……oh lookey here…there is Coal way yonder! Haha! Yay for blind eyes! ;D Thanks! If you ever want something they probably would have used, you can always do an “Our Father.” That’s a quite early prayer. The “Hail Mary” gets the point across perfectly well, though. I actually debated between the two, but went with Hail Mary because I felt Hedda would pray more toward a human woman than a lofty deity. Historically inaccurate? Yes, but so is a number of other things in the comic. Thank you! I’m no expert but since when do the palms of the hands have freckles. Typically the palms of your hands and the soles of your feet are pretty pale and featureless, except the prints. Hedda: *trips and glomps Coal* Oh dear. O.O! Also, I love this page. And it makes me love Hedda more. I don’t think you can have freckles on the palm of your hands. Only on the back side. Yes, I know. Thanks for reading! Haha! Actually they’ve found so many pendants that it was probably worn by both sexes. Thor wasn’t so much a warrior god as he was just a god of men, and many people thought of the Mjollnir charm as protective. I can’t say for sure if women would have worn them, but I think Thor was popular enough that they might have. You have my thumbs up on this, the idea of the prayer is what counts. I like her so far and I love meeting new characters, great job and keep it up! Yay! I’m glad you and others are liking Hedda. :3 Thank you! Should have gone with the Our Father.